I'm currently looking around for a camera bag again, which is, to a photographer, the equivalent of a nasty fungus in an embarrassing place that flares up from time to time: just part of the burden of our existence. Because everyone knows two things: 1.) most bags will serve, if you'll just relax and adapt and get over it. And 2.) no bag is ever just exactly right. I don't care—shop all you want—devote your life to it—you'll never find it. It's not out there. That's the whole gestalt with camera bags. What I'm looking for at the moment is a small shoulder bag that can hold my medium-sized Panasonic G9 with its 12–35mm ƒ/2.8 lens, with enough room left over for the 35–100mm ƒ/2.8 lens I hope to buy next year. I hate shopping for camera bags because there's too much choice. It's overwhelming. There are oceans of the things—single brands offer, sometimes, dozens and dozens of models, and even forums of photo fans working together can't name all the brands. We could try for a week to compile a list of all the camera bag makers and three weeks from now we'd still be getting comments from passers-by saying "you forgot [blank]." As a way of bringing this all under some semblance of control, I tend to look only at what I call the "T bags"—Tenba and Tamrac. They're two big-name, good-selling, sensible mainstream brands that I've had good luck with in the past. My bigger bag is a Tenba, and I really like it. Of course they don't make it any more. Bag fashion moves fast. Of course, I have some preferences and a few features I'm looking for in my G9 bag. I want it to be the right size. It's easy to buy a bag that's too big, but I already have a big bag (that I use when traveling to see my girlfriend in the Finger Lakes—in other words, it's in the basement and dusty now), and I don't want to use a big bag with just the little camera knocking about inside it. I want a detachable strap, so I can substitute one of my favorite UpStraps if I want to (they don't slip off my shoulder; everything else slips off my shoulder). I want a bag that does not have too many dang compartments all over everywhere; I've seriously had camera bags in which I can lose things because there are 39 compartments and pouches and pockets hidden everywhere. I'll stick a card in a little top-secret zippered slit hidden in the bag somewhere and never see the damn thing again. I prefer a flap I can leave closed but unfastened, such that I can access the camera quickly while still giving the innards of the bag protection from, say, drizzle. I want to be able to situate the camera with its handgrip facing up, so I can grab it easily (and I absolutely don't want to have to separate the body and lens to stow the camera away). And one more thing—I know this is a bit of a conception problem, but I really don't like the idea of a bag that needs a bag. Yes, I know logically that, in a downpour out in the woods, even a rain-resistant bag might need to be wrapped up in something else to prevent water from finding its way in, but, sorry, I really have an aversion to bags that need "rain covers." It's like when I buy a bag of Yukon Golds at the supermarket—nothing else, just a bag of potatoes—and the checkout clerk says, "Would you like a bag for that?" I always want to reply, "they're already in a bag." I never do, because I know they're just doing their job, but why would I need to take fourteen potatoes that are in a plastic bag and put them in another plastic bag? And if that makes sense, why not put the bagged bag in another bag? Because they're heavy, so they might need to be double-bagged. In which case they'd really be triple-bagged. I'll stop now. This is the Lowepro m-Trekker SH150 shoulder bag, and I suspect it meets all my requirements as listed above...but there's that problem. I don't care to sashay down the boulevard proudly declaring my affiliations to every curious glance. I don't like wearing brand names on my body. It makes me feel like a peasant, a vassal to my corporatist overlords who live in the big castle up on top of the hill. I sort of make a personal policy of not doing it. And except for my Bears cap, which I bought when the owner of the Chicago Bears invited me to be his guest at a Bears game, I don't even wear stuff that proclaims my sports allegiances. Although that's probably partly because there are no Ronnie O'Sullivan caps or Ronnie O'Sullivan T-shirts or jerseys. At least I don't think there are. And, with all due apologies to the good folks at Lowepro, "Lowepro" is just not a name that has resonance, provenance, and romance to the average Joe Sixpack and Jill Boxed-White-Wine on the street. It's not like "Ferrari" on a car or "Gucci" on a woman's handbag. I don't think it does my status any good to have my plain cordura bag brashly proclaim, "I'm the type of fellow who uses Lowepro! Smell me!" Nor do I think others out in the world will be quietly thinking as I pass, ooh, Lowepro. That guy's cool. No offense. They think they're all that—that's why they blazon "Lowepro" on the face of the flap so prominently like they do, like it's Armani or Ralph Lauren—but no one else does. I doubt anyone but photographers who have made themselves cranky shopping for camera bags would even know what Lowepro is or what they do or who they are. And while I'm griping, a minor peeve: Panasonic really ought to give up on "Lumix," too. It was supposed to be the brand name, like Pentax was originally the brand name for Asahi's SLRs and is now the brand name for Ricoh's DSLRs. Nice idea...I guess. Would have been nice if it worked out. But you know what, Panasonic? It didn't take. Would have been nice if it did, maybe, but it just didn't. Everybody calls your cameras "Panasonics." Time for you to deep-six "Lumix" and move on. We like you; you should like yourself. Use your own name like everybody else does. While everyone else calls Panasonics Panasonics, Panasonic grimly hangs on to "Lumix" like a procession of leper monks in the time of the plague. Poor perished horse done been beat long enough now. But while I can put a little piece of electrical tape over the shouty "Lumix" on my G9, apparently I am going to have to go out and about shouting "LOWEPRO!!" to passers-by, as if it were precious to my self-identity, which I assure you it is not. Because the m-Trekker SH150 would be probably be about perfect for me, except for that one imperfect thing. Which means that it's like every other camera bag: good, yet just not quite right. Kirk Tuck (partial comment): " I take huge, big issue with your categorization of Think Tank as a 'hipster' bag company. Every professional, working photographer I've ever met has at least one of Think Tank's fabulous rolling cases [link —Ed.] because they are so well made, reliable and well designed; and the Think Tank backpack I bought recently made carrying on gear to 26 flights in six weeks, including an international flight, a much better experience. It. is. PERFECT." Mike replies: But Kirk...you're a cool hipster! I meant it as a good thing, not a bad thing. Isn't hipster sort of part of the job definition for most pros? I worked for a studio pro in the '80s whose style was decidedly, recognizably '70s, and he didn't last much longer—retired to his 90-foot sailboat. Woe betide the pro without his or her finger on the pulse of the latest styles and fashions, or am I wrong? dogman: "When you buy the Lowepro bag, get it in black and also buy a black Sanford Sharpie pen. Immediately sit down with the Sharpie and carefully cover that offensive logo. It will still be there but now it will only whisper 'lowepro' instead of scream 'LOWEPRO.'" K Williams: "I'll make a suggestion from the Cool Hipster brands, a Think Tank TurnStyle 10 (or maybe 5). This is my favorite camera bag by far and like many I have had quite a few. This one is the only one that really stands out from the crowd. You will forget you are carrying it after a short while. Very comfortable. Not too big. Just two moveable dividers inside. Very easy to get to your gear also and to change lenses inside the bag. Will hold a G9 with 12–35mm and 35–100mm with a little room to spare. The TurnStyle 5 may be able to hold that also but I don't have one. No flap and it comes with a bag to put over the bag in case of heavy rain, but I've never had to use it." Hugh: "Have a look at the Billingham L2. I think it’s the perfect small bag...."
Ricardo Silva Cordeiro: "I was on the same page as you last month, shopping for a new medium-sized messenger camera bag that would replace my previous good-looking but cheaply made one (which started to fell apart after 1.5 years; come to think of it not bad actually for something with a daily use that cost me 35 bucks). I was investigating online and was still torn between a good but super expensive one and another good-looking but cheap one. But then I was just walking trough a store and saw 'the one': a Manfrotto Manhattan Speedy 10. It has everything I wanted, elegant and discreet, perfect size, lightweight, good materials and rain-proof, good access to gear and enough pouches/organization. It even is possible to carry a small tripod with some straps on the base. Also the price is right in the middle compared to the other ones I was deciding, one more factor that made me look at it as the 'goldilocks option' for me. Here's two good videos on it, it's not like checking it in person, but close enough: [one, two] both from Manfrotto." Mike replies: Manfrotto recently acquired the Kata bag brand, which as far as I know were made in Israel. Although the Kata brand name was retired, Manfrotto promised that Kata's DNA would find its way into Manfrotto products. I wonder if the Manhattan Speedy 10 was previously a Kata model? I don't know the product lines well enough to guess. Mike Plews: "I have a Tenba bag that I bought in 1983 that is still soldiering on but is way too big for a walk-around. Being incredibly cheap I popped for the Amazon Basics bag you featured. It easily swallowed a Nikon D7100 with a grip, an 18–70mm Nikkor, a 70–210mm ƒ/4 AF Nikkor (the old design) and an SB600 flash. May be swapping out the flash for an 11–16mm Tokina shortly and I expect it to fit just fine. "Will this bag last 30 years? I'm 69 and I doubt I'll find out. For the money it is terrific, maybe perfect for my needs. Your mileage may vary." Pierre Charbonneau: "The bag I have been using for all my errands and travel since 10 years+ is an Artisan & Artist ACAM-7100. A Leica M and two lenses do fit very well. The bag is discreet, very light and well padded and cost dearly. It wears very slowly, considering the daily use. I may have never to replace it, which sweetens the initial price." Mike replies: That's a great bag, but I fear it would be just a touch small for my equipment. I think it was made especially for a Leica if the name at the link is any indication! Yanchik: "Greg Lowe and his brother were cutting-edge US alpinists in their time. And that time was one when climbing gear was rare and poor. So one or the other or both (I forget) set up Lowe Alpine, with LowePro as a brand extension. To me, a mild alpinist, having seen Greg speak while struggling horribly with Alzheimer’s towards what is surely the end of his life, these guys are the real deal—I suspect I am not alone amongst a demographic of climbers. My reply intended as an informative broadening of your horizons, rather than a rebuke. Stick it to da man by all means, but dis is not, I think, da man." Mike replies: Thank you for the background. I did not mean to disparage the founders; however I think "Lowe Alpine" is a much cooler name. The word "pro" just reeks of cheap and by-rote to me. Not their fault, I know. William Cook: "Good afternoon. My name is Bill and I’m a bag addict. Closet full of them. I’ve had all the major brands at one time or another; always searching for the elusive perfect bag in the messenger bag format. As you concluded, there’s no perfect bag. I finally figured that out—mostly. Now I only buy one brand of bag, Tenba. For me, that brand has one perfect feature that, as far as I know, no other brand has. That is the zippered access on the top of the bag flap for quick entry into the bag. My current choice is the Tenba Cooper series. Not sure which size would meet your needs." Mike replies: That's why I like my Tenba bag too. I'm not sure if the smaller Cooper bags have the top access feature, and the Cooper website is remarkably unhelpful on the question. (For others reading along, Cooper is Tenba's premium line.) I rejected the larger Cooper bag as my travel bag because it has no padding at the bottom of the laptop slot, which seemed like an insurmountable defect of design—I don't want to worry about damaging my computer every time I set the bag down. I'd love to see the Cooper lineup in person. Moose (partial comment): "The perfect camera bag exists—then it doesn't, then, perhaps after a long hiatus, another one does. It's not that the bags go bad. It's not my fickle taste. It's the equipment that changes." Dave Van de Mark: "You had me laughing the whole way through your bag priorities and laments. I have about four and none is perfect but I'm going to die with what I have. No more looking, period! "But even more painful is trying to get rid of them. I had a dear friend pass away several years ago and his family entrusted me (begged might be better word) to move most of his gear. I soon discovered hardly anyone much valued "previously owned" bags. Didn't matter if they were worth hundreds. After explaining this to the family, I gave most away or managed to sell for 20 bucks. Part of the problem was they had really been used and looked it for sure, yet all were good for many more years of reliable service. Everyone wants to pay outrageous prices for the 'rights' to get it dirty themselves." Kevin Crosado: "I've been using a couple of Crumpler bags for 10–12 years now (they were what my favourite local photographic store was selling at the time). They work pretty well and are still in good condition despite a fairly hard life (forests!) (rivers!) (coal mines!) (sawmills!) (rail yards!) (trucks!) (workshops!). But will they survive the greatest assault—their owner being outed as a geriatric hipster by some internet commentator?" GKFroehlich: "I have upwards of 25 camera bags—one for each of the 25+ categories of photography I avidly pursue." Ernest Zarate (partial comment): "My favorite bag of all time (but too small for what I work with now) was a gray, WWII vintage Navy gas mask bag, model ND Mark IV. I got my first iteration at a Navy Army surplus store on Market Street in San Francisco in the mid 1970s. At the time, I had an Olympus OM-1, with a couple of lenses. It held a few rolls of film as well. I had to put a sheet of cardboard, cut to size, in the bottom to give it form. But the length of the shoulder strap was perfect. And it was completely unobtrusive—did not proclaim 'photographer' at all. That gas mask bag (and the second one I got, after I wore out the first) served me well. It held my Leica M6, and even my Mamiya 6 (a compact medium format camera with 50mm lens). I ended up gifting that bag to my eldest son who continues to use it as his camera bag." Ilkka: "Just a small correction or addition since you brought it up. Panasonic was originally a brand name, not the name of the company. Matsushita Electric Industrial Company started making rice cookers and other home appliances before the war and at first used National as its brand name. When they started to make other things like radios they started to use Panasonic as another brand name. They have other brand names as well, like Technics. Eventually Panasonic became so well known that they changed the name of the company to their biggest brand name. A bit like the cameras made by Leitz were named Leica and eventually the company changed its name to Leica Camera. [Or not quite; the Leitz family sold Leica and forbade the new owners to use their name. But I take your point. —Ed.] Panasonic is too long to put in the front of camera. Konica Minolta was a silly name, and too long. Luckily Sony took it over and changed the name. Lumix tries to be something similar, short and easy to pronounce." In under a minute you can use a black permanent marker to make that LowePro logo all but disappear.. works just as well on those monstrous brand-name shoulder billboard/straps too. My primary source of camera bags has been op shops (charity stores). Failing that, art and craft markets often have good offerings at more reasonable prices. I looked for a small bag as well, chose the Tenba Cooper 8. Seeing how the G9 is taller that my camera (E-PL7), I can't advise it for you. But the design and build of this bag... I love it! (and I use this bag whetever there's a camera inside or not). About ONA I had tested a larger messenger bag and didn't enjoy it: way to rigid and heavy (and having a Domke bag too I enjoy a bag that's the opposite), the strap design was bad (the strap wasn't ajustable to a short enough length, and would twist itself inside the metal loops, why !?). But maybe the brand solved that in later models. My small bag requirements are even harder to fulfill! I too would like a shoulder bag that is waterproof, but it cannot have any velcro or jangly bits that make noise. That's because I record audio. It must be light and not heavily padded. Inside pockets and other things that take up room are not needed. The bag cannot scream "expensive gear", so it's better if it doesn't look like a camera bag. I need it to be 12cm deep, 18cm wide, and about 24cm high. I have found it impossible to find such a bag. Though I bought one from China a decade ago. My go to bag is a Vanguard Havana 21. It holds an E-M1 with an Olympus 12-50mm and a Panasonic 45-200mm quite nicely. If your G9 kit is a bit larger, a Havana 33 or 36 model might be a better fit. They include a rain pouch to cover the bag and don't scream "camera bag." Perhaps if a respected and influential source were to advise Panasonic that Lumix is easily confused with “lummox” in American English the company would retire the name. Just put a slap of black Gaffer's tape over the damn logo on the LowePro bag and get on with it. You might even come to find extra and handy tape can be a photo life saver. If the bag is "just right" then there are dozens of ways to obscure, cover or remove the logo. A little initiative? I also take huge, big issue with your categorization of Think Tank as a "hipster" bag company. Every professional, working photographer I've ever met has at least one of Think Tank's fabulous rolling cases because they are so well made, reliable and well designed; and the Think Tank backpack I bought recently made carrying on gear to 26 flights in six weeks, including an international flight, a much better experience. It. is. PERFECT. Think Tank shoulder bags are also great and, bonus for you, the one's I've used have no visible logos. Now, on to the "Lumix" thing. It's a heck of a lot shorter to put on the front of a camera than "Panasonic". But I'm wondering where in the world you are getting your research about the widespread rejection of the Lumix name by all even folks remotely associated with photography. A whole new generation of photographers have seen the Lumix brand for most of their photographic lives and many of the students I meet in my role on the advisory board of a vocational college refer to the cameras as Lumix cameras. Have you canvassed photographers all over the country as to their mirrorless camera naming preference made by the Panasonic corporation? Or just the photographers within a certain radius around TOP HQ? Asking for bag advice will get you more than a few responses, think. I've settled on a Peak Design Everyday backpack, and judging from the quality of that design I would not hesitate to recommend their 5L Everyday Sling for your purposes. Looks like it's quite popular, and it just squeezes under $100. one for Nikon gear and the small one for Panasonic. Black is my choice of color and they will stand up to any weather and lots of abuse. You indeed get what you pay for with Billingham. My next bag will be a cheap canvas messenger bag and a decent insert. No need to spend the big bucks on a camera bag. Amazon has many to choose from. Damn, Mike! You're really obsessing over this aren't you? As tempted as I am to offer a suggestion or two, I suspect you'd just answer back with an essay on why you hate bags that have zippers that pull from left to right as opposed to the other way. I shall instead simply wish you good luck and godspeed. Black gaffers tape would probably fix the imperfect, "perfect" bag. I just recently went through this same thing. After the better part of a year I purchased the Tenba DNA 15 Slim. It works great for what I needed and might work for you as well. I have the Amazon Basic Bag. The Amazon label on the flap is made from some sort of rubbery plastic. I ripped if of using my bare fingers. The label had actually been sewn on, but the thin thread was easy to remove with a little help from my Swiss army knife. No traces remain. A very good bag, excellent for the price. Just what you need. One of the Tenba messengers should suffice. Admittedly it has branding on it but it is low key. I use one for both cameras and commuting - the camera insert is removable. I wouldn’t rule out the Billingham bags, though they are pricey here in the U.K. and maybe even more so in the US. They are ‘bomb-proof’, waterproof and very subtle looking. You might just get away with a Hadley Digital, which I think is their smallest and simplest bag. I have one that I can just about fit a Fuji X-Pro2 with the 18-55 zoom attached and 16 1.4 prime (or vice versa). There’s a small front pocket for spare batteries etc. You might need a Hadley Small or an S2 bag for the G9 outfit, which are a bit more money. The other issue is that the strap is not removable, but it isn’t slippery and is quite comfortable. I’d definitely buy another if I needed to, but I can’t see mine wearing out any time soon. I know you have a problem with logos on bags but a pro who travels a lot once suggested stashing your camera bag inside one of these if you don't want to worry so much about thieves. On showy logo's - God invented Gaffer's Tape and magic markers. A simple solution. I think photographers obsess over bags more than they do cameras. And I’ll bet they have more bags lying around than they have cameras! Have you considered a messenger bag? Timbuk2 is one of the oldest. Their bags come in various sizes, don’t have excessive pockets, don’t scream expensive camera gear inside, can be left unlatched for quick access, are modest to moderately priced, and can be customized. Another company, rickshaw bagworks, are completely customizable and made in San Francisco. Since these types of bags are not specifically made for cameras they do not have any padded inserts. However if you search “camera bag insert” on amazon many come up. I know this goes against the bag inside a bag issue, but the upside is you can find one sized exactly for your needs. And the messenger bag can do double duty: your camera equipment is kept in the insert at all times and is quickly removed so the messenger bag can be used for other things. I still like the Domke bags. Even the small ones are big enough to hold a small full size DSLR kit and are certainly big enough for m4/3. But, a few years ago I indulged in the Billingham Hadley Pro ... and it's great. It is certainly a bit overpriced for what it does, but unlike at least one of the other brands that you lumped into this bucket (Ona) the bag at least works really well and does what it is supposed to do without getting in the way. So I say get the small Billingham for your small camera. IMHO The Think Tank bags are the natural up-market evolution of Domke, but with too many overly-clever design touches and waaaayyyy too many pockets for things to get lost in. But for pro photographer logistics they are probably great. I just need a formless box to put a body and two lenses in, so it's just too much. Finally, the last time I looked at camera bags I classified them into the many of the same buckets as you. I came out the other side still thinking that either Domke (cheaper) or Billingham (not so cheap) were the best move, and I still do. I've been using a Crumpler bag (don't remember the name) as my primary camera bag for 10+ years. Not perfect, but close enough. It warms my heart to know that for the first, and likely last, time in my life, my choice makes me hip. I see the late Michael Reichmann wrote a review for the Upstrap back in 2009! (https://luminous-landscape.com/the-upstrap/) I guess I've been under a rock for a while, but then my camera strap has done OK with my "3M" Pentax SL screwmount. Too bad you really hate the prominent Lowepro logo. I guess it's analogous to the Coca-Cola t-shirts of the late '80s or early '90s; a screaming advertisement. Good luck on your search. I'll need another camera bag if I every buy a digital camera. Your "seat-o'-the pants" guide was handy! P.S. Tamrac Derechoe = Derecho? Suitable for use in hurricane winds? Yes, the first thing I do is remove all logos from my camera bags. Usually have to modify them if they are not weather tight and if they have a big velcro closure that screams upon opening, I get rid of that too. I have a bin full of various inserts and dividers to customize beyond what the manufacturer supplies. Choose a subtle color like black, brown or grey that doesn't stand out. I have also removed the red dot from all the Leicas I have owned and replaced it with the black dot. For traveling light with camera and 2-3 lenses I like the small Dome bag, FX-5 or something like that (don't remember, tossed the labels) that is modified as above. Very compact and inconspicuous. If you really like the Lowepro (or any bag with a too prominent embroidered logo) just take a black Sharpy and dye the logo to match the bag. Stealth logo. I loathe bags that are bigger than I need just as much as bags that are too small. I would get the smallest bag possible that will comfortably hold the G-9, 12-35mm zoom, spare battery, lens brush, lens cleaning cloth. When (or if) you buy that other zoom (35-100mm) only then would I look for a bigger bag. That second bag becomes my two lens bag. The Lowepro logo isn't there so that you look cool carrying a Lowepro ... it's there so THEY look cool when Mike Johnston carries their bag ! I can't help much. I haven't really carried a camera bag in a while - I used to haul a backpack full of lenses around, with a tripod, doing nature photography, but these days, I typically carry one camera & lens on a BlackRapid strap and then an RX100 on a little belt pouch. I mostly use camera bags for transporting gear (in a vehicle) - to a vacation spot, to a friend's house, or just for a drive - but then I don't carry it around. I have one (Tamrac, I think) bag for carrying a small Sony e-mount kit that's pretty small & convenient for body&lens plus a second lens, but it would be too small for the G9 - an A6500 just about fits in sideways, grip up, like you show. I've always been partial to Tamrac bags. p.s. I agree about Loo Mix (or is it pronounced "lummox" ?). They had the right idea with a two syllable name, but that was about it. Think Tank Retrospective 5 or 7 is about 95% of perfect for me (I think I'm way too old to be a hipster). My guess is you would love it too. My only gripe is I wish the silent option used magnets to keep the flap closed a bit more tightly. However it's never proven to be problem so I'm not sure why I'm griping - make it practically 100% perfect for me. Mike, Kirk is right about Think Tank bags and other containers. I have a big Billingham that stays at hime now because various different sized Think tank shoulder bags are better thought out and COMPLETELY ANONYMOUS. They are just black with no big logo. I haven't comparison shopped for prices of Think Tank vs Lowepro or Tamrac though. At the end of the day, they are all just camera bags. I can say that, echoing Kirk’s remarks, ThinkTank (Retrospective series) has been my latest favorite brand. If I’m going to use a “camera” type bag for small gear I’ll probably grab a small or medium Retrospective. I’ve also long been pleased with LowePro’s products. Although I’ve not bought one for a while, their designs have been durable and thoughtful. One of their larger bags has become my schlepper for heavy medium-format stuff. But, personally, I abhor carrying lots of gear. The more I schlep the worse my concentration on photographing. So lately I’ve most often eschewed using “photo”-type bags in favor of general travel bags. Thanks to using smaller cameras and lenses I nearly always travel with a bag by PacSafe, usually one of their Metropolitan sling bags (“murses”?). Slim, body-hugging, easy to stow, durable and thoughtfully designed (and not over-designed) for travel. Domke wraps serve to protect cameras and lenses from in-bag bashing. I now have four in various sizes and designs. Love ‘em! Never heard of "Gaffer Tape". Think of all the photographers with Expensive German Cameras, with a bit of Gaffer/Insulation Tape placed over the Red Dot. If the tool does the job and you don't like the Name/Brand or to advertise it, disguise it. Personally, I am a very happy user of ThinkTank (I have three, the 5 7 and 30), and a fairly happy user of a Ona Union Street (why just fairly? because the asymmetric hand grip really bothers me). I rarely use the 5, which was bought with the "just beg enough for" principle in mind; I realized too late that one often needs to carry extra items such as a book brought from home or bought along the way, and a "just enough" bag quickly becomes a "not quite enough" one. In that, both the ThinkTank 7 and the Union Street work fine, with the TT7 being by a good margin more versatile in actual use (bless the velcro straps and countless pockets for passports and wallets). The Union has the advantage of looking a bit less of a camera bag for those urban outings when you want to be a bit more discreet. I alternate according to mood and specific need. What is crucial, always, is to never ever ever change bags without emptying the unused one first! The ThinkTank 30 is a monster, and I found it comes in handier as a 15" laptop+hard drive+sundry items travel bag, to be strictly coupled with the TT7 doing its 'regular job" of carrying the camera(s) in transit and when one reaches destination. Historically I've been paralyzed by the choices available and prices charged. Then I bought a new Canon camera that came with a Canon backpack style bag -- a brand I had never considered. 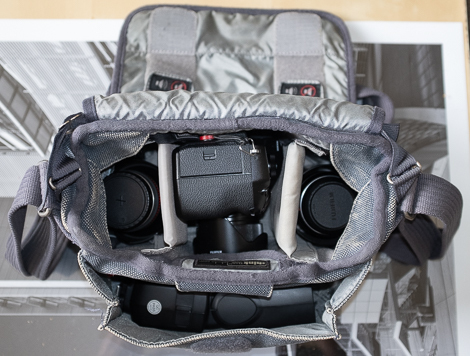 What would Canon know about camera bags that specialist companies don't? I've been using it for years and it's been a terrific bag. The only downside is the very nicely done Canon label. I would rather not advertise that the stuff in the bag might be more valuable than dirty socks. Coda: A couple of years ago another new Canon camera arrived from BH with another new Canon bag. This time a gadget bag. Also very nice and useful. Something that I never would have bought but use often. I just looked at Amazon Basics camera bags. The prices are … very low. Cheap even. I have purchased other Amazon Basics products and have been pleased (surprised even) at the quality. Yeah, you're right about The Photographer's Eternal Quest. Like Lucy and the football, it will never turn out to our complete satisfaction. But I have come close: for the past several years my small (everyday) bag has been a Domke J-5XB ($79.49 at Amazon). The "J" in the product number is for the ballistic nylon version, MUCH superior to their regular cotton canvas ones. I have two of them because in 2014 I found one on eBay - brand new but sans the strap - for $15. This bag (which is 10 x 4.5 x 7.25 inches) holds my (admittedly small) Fuji X-30 and all sorts of daily accessories such as wallet, business card holder, small case for extra batteries (2) and SD cards (2), sunglasses in soft case, VA Volunteer ID plus lanyard, small note pad, two pens, pocket comb, microfiber lens cloth in soft case, and, when I think I'll need it, my B&N Nook ereader. Although I don't have one, a cell phone would fit in there too. Take out the wallet and maybe the sun glasses, and there's room for your Panasonic with wide zoom attached plus the longer zoom in the area where the wallet was. It comes with two moveable dividers, and is advertised as a shoulder and belt bag. I absolutely love it (even though I could improve it if Domke asked me to). See it at Amazon: https://www.amazon.com/Domke-700-J5B-J-5XB-Shoulder-Black/dp/B001D5OD7M/ref=sr_1_1?ie=UTF8&qid=1547478344&sr=8-1&keywords=domke+j-5xb. Gaffer tape over the logo. Hipper than hip. Don’t be afraid to modify a new purchase. A Sharpie can be just the ticket for blacking out gaudy brand names. I cut the carry handle off the tank bag on my motorcycle the moment it arrived at my front door. Reviewers said it was a great product except that the handle scratched their tanks. Ya know….Epson makes a decent iron on paper. You could make your own Ronnie O'Sullivan cap. I’ve found that quality dye based inks work well for this….haven’t tried pigment. My most used bag over the last 10 years is an ancient Tamrac holster bag. It currently holds my body and 135mm in the main compartment and the 40mm pancake in the small front pocket. I've had a Tenba Messenger DNA 8 for a couple years. It fits an EM1 with 12-40 and a couple small primes. One unique feature I like is the main flap zips open across the top, so I can remove the camera while leaving the flap latched with the smartly designed magnetic clips. I'd seriously look at other letters of the alphabet... In particular B. The Billingham Hadley range is superb. I use mine every day commuting on public transport in London and it's still in excellent shape a few years down the road. Simple, subtle (especially in black), superbly well made and with nothing done to excess. 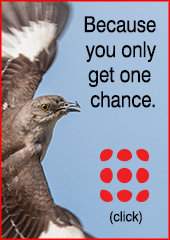 It has a flap that's easy to close but can happily be left open. And it doesn't need a cover to be waterproof. It does not have a detachable strap but the one it comes with does a very good job of not slipping. Best thing is, it looks even better once it's worn in a bit. I'm struggling to think of a negative. Yes it's expensive but not stupidly so... And I think you do get what you pay for. I'm usually carrying my two GX8s and several lenses in it. Mine is the largest of the three sizes. You could probably use one of the smaller ones for what you want to haul around, likely the smallest, which is a great bargain. It's almost (of course) perfect for a micro 4/3 system. I wish it had a handle on top so I didn't have to pick it up by the shoulder strap. On the other hand, the shoulder strap is not bulky and it really (seriously) doesn't slide off my shoulder. It does come with a rain cover, but I've never used it. It's made of a material which seems like it would easily shed pretty anything short of a monsoon. I like Domke bags the best for their simplicity, durability and practicality. That said, I have been a bit frustrated that there are still “improvements” that I would like to see... to the point that I have given serious thought to creating my own designs and having them produced. I even have a name for the line I envision. For my first attempt I enlisted a friend to create some initial drawings that I could then take to a proper designer. Alas, he never completed the task and I’m not sure whether I’ll have another go at it. Oh, forgot to mention that the flap closure on that Tenba bag is magnetic...so silent when opening it and secure without having to mess with a buckle to open and close. That's a big plus to me. The Domke F-5XB will work with the G9 and the 12-35mm attached The 35-100mm stands vertically. I use just one divider. Sharpie is the gaffer tape of the textile world, when it comes to hiding logos. I simply take a large permanent marker and colour-in the logo. You will end up with a dark grey with a touch of dark orange on black sort of look. Almost classy. Sharpies work wonders for "too-loud logos." Another solution is to find an embroidered patch you like and "shoe goo" it into place. At 82, I don't qualify for cool anything, but I do like some of Think Tank's offerings. I only leave the house with one camera and at most 3 lenses, usually only one. I finally found the perfect bag for me, a Domke F-5XB. Similar in size to the Derechoe. Five rangefinders and lenses live in a Vanguard Supreme Divider Insert 46, just the insert not the case. I pick from these as I go out the door (or another from a total of 11 cameras my progeny will sell after I am gone because I just can't, and that will probably pay for the funeral and the party.) I like the Domke because it has a zipper. I don't like those clicky slider things, as they always pinch my fingers and leave a painful welt and I play classical guitar, not to mention hold a camera and click a shutter. I also have 3 or 4 Tamrac bags which are really nice, but just for storage now. Two are those little backpacks, the Expedition 3, that they don't sell an more. Shame. 1). Deal killer for any bag for me is a Velcro closure, so that the bag loudly goes RRIIIIPP when you open it (Domke, are you listening?). 2). Get the Loewpro bag, but a bit of black gaffers tape over the logo. Voila, no branding plus instant cool. Bonus points when the tape starts to dog ear. I’d put Domke and Think Tank with the sensible bags, though the TT retrospective line has way too many pockets to be sensible (that’s the exception). While a Billingham is expensive, it’ll also last and age well, which cannot be said for most other brands of bags that fall in the luxury category. I agree with the Lowepro branding issue, but I’m also the guy who goes out of his way to remove or hide any branding on my camera bags, even the Domkes. Think Tank started out making very well designed bags for working professionals. Their bags and rolling cases were (are) designed for large cameras with lens hoods, fast access, and comfort. Their waist pouch system is the best out there, bar none. I have at least four of their rolling cases, three or four backpacks, and at least ten shoulder bags. But, yeah, nowadays they are definitely edging into hipster retro camera bag territory. Not liking a lot of their newer designs, especially shoulder bags. You forgot Fogg. A B-sharp is all you need. If you can get out of the "T" bag universe for a moment, take a look at "Domke 701-83A F-803 Camera Satchel Bag -Brown". It will easily hold everything you listed with space left over for extra batteries, etc. It's deeper than it is wide, so it doesn't stick out far from your body, looks unobtrusive, fits easily under an airplane seat with room to spare. I carry my E-M1 kit around in a Think Tank Mirrorless Mover 30. Just the perfect size for the camera, a couple of lenses, a flash, and the other doodads that we need to carry. It can also carry a normal sized iPad. It is a very useful, yet compact bag that I have with me everyday. Plus, I am the farthest thing from a cool hipster. Much thanks to Kirk Tuck, with whom I nearly always agree. You and he are not only photographically knowledgeable, but skilled writers as well. He has saved me from going on at length about your comment re. ThinkTank. They make high quality, exceptionally durable and well designed bags. the apppelation Hipster brings to mind the folks that wax on about the advantages and purity of sound of vinyl records, while listening to thme on a $50 retro portable all in one record player from WalMart. Of the six or eight I own, the Mirrorless Mover works perfectly for either my Panasonic GX7 or Olympus M5ii and three lenses, along with cards, batteries and such. I prefer messenger bags, so I have the messenger bag over one shoulder with the bag on my back and I have the camera on the other shoulder with an UPstrap. If the weather is nice, then I use a really small messenger bag and don't worry about putting the camera in the bag at all, and just have a lens or two stowed in there and some accessories. I live in Southern California, so this is usually my default. I also like to load the camera in the bag with side grip up. I use Timbuk2 messenger bags with a camera insert, but they don't make the kind of inserts I like anymore, which are shaped like a messenger bag and fit in seamlessly. Starting over I'd probably go for a Think Tank Retrospective, the smallest one that would fit my gear the way I like to carry it, but I'd research messenger bags. That said, I hope to not have to buy another bag for like...forever. If I had to get a bag I'd probably just find a messenger bag that I like that I could use my current inserts with, just to be economical if nothing else. As an aside, messenger bags are kind of nice because they don't (for the most part) look like camera bags. The Timbuk2 messenger bags are cool though, you can design your own colors and materials, and the materials are available in totally waterproof or simply weather proof versions, as well as fabrics. I don't get out much in the rain, but the bags keep things dry. They come in all sizes, I have an extra small and a small as far as their sizes go. Smaller and lighter the better. I don't like feeling like a pack mule. I have one Think Tank backpack, one roller and two laptop cases in different sizes. All are at least 10 years old and still look like new, give or take. I expect them to see me out. For strobe cases I like Lightware but I did have a zip failure after 20 years in service so they lose half a point. Basically, if I need it and Think Tank make it I need look no further. I can't and don't intend to speak for Kurt, but I think the usage of "hipster" may be his issue. 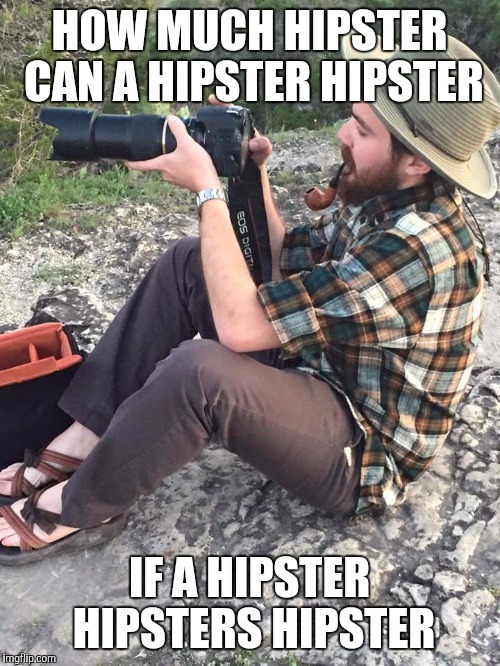 In my experience, "hipster" is generally used as a pejorative to denote someone who wants very much to look the part, but may not be genuine. Or is trying really hard to make it clear that they're unique and different from everyone else. When I was coming up, it was "poser". Think of this like the Lenny Kravitz Leica "brassing" or a bag with distressed leather - looking the part without having earned the cred. And on the bag front, I recently upgraded from my old "just fine" Tamrac sling to the "hipster" Peak Design Everyday Sling (10l) and could not be happier. This thing is engineered to death (versatile foldable dividers, strap ends hide away, expandable) and is super useful for photo-focused treks, while still having enough extra space for other essentials while travelling. And on top of all that, it's a very handsome bag - sleek and minimal with their only logo being a small patch with black text on a black tag. I carry my X-T1 with three 1.4/1.2 primes (one mounted) with plenty of extra space. For strictly photo gear carrying, the 5l would do for me, but I like the versatility. A black Sharpie will turn the volume way down on that logo. "I don't like wearing brand names on my body. It makes me feel like a peasant, a vassal to my corporatist overlords who live in the big castle up on top of the hill. I sort of make a personal policy of not doing it." This, this... a thousand times this. I have a G9 with the 12-35 f2.8 and the 35-100 f2.8. I resurrected my over 20 year old Lowe Pro Off-Road shoulder bag. Works great. B&H has a used one for $35. A couple of category errors, I think. Crumpler, Peak and Think Tank are in no way Hipster. Domke and Billingham, however, do belong in the Hipster camp along with Filson. Which means, having been on the camera bag merry-go-round years ago, my favorite 'camera' bag of the last few years is an old messenger bag with some padded inserts. Plenty of room and more for a body and one or three lenses and can all be moved in a second to any other bag if desired. Doesn't advertise what's inside, either. I've given up on camera bags completely...I've never yet found one I like (I can use the Peak Design 20L Backpack, from time to time, but that's about it). They're all over designed, and yet somehow not useful. Too stiff, too much padding, never enough room for anything other than camera gear. Since most of the time I'm carrying other things, but want a camera along for the ride, I've been happier with picking a general bag I like for all-around usage, and adding a little padding or an insert for the camera. Still, as you say, nothing perfect exists. If you Google Ronnie O'sullivan merchandise, you will find Rocket t-shirts, but alas no caps. But seriously, my experience with ThinkTank has been very very good. Mine is very well-thought out and the right size for micro 4/3rds gear, I'd say. It's very functional despite its good looks. And, for the record, this aging hipster only thinks the Retrospective is the hipster-looking line. The other lines look perfectly boring and perfectly functional, and so may work just as well or even better. The perfect camera bag exists - then it doesn't, then, perhaps after a long hiatus, another one does. It's not that the bags go bad. It's not my fickle taste, it's the equipment that changes. Latest of a long line for me . . . I had the perfect camera bag (a Tenba, no longer made, of course.) Then a PLeica 100-400 replaced my Oly 75-300, and the combination was too tall. Now, I have another Tenba, and it's close, but getting the height gave me width I don't need. Fortunately, Tenba makes the camera holder a separate thing, so I removed it from the first bag, and it's now my favorite second carry-on item. Do you live in striking distance of a real camera store? Bags are one of those things best found with gear in hand from a wide selection in person. BTW, I don't understand Domkes. What is with those metal clips? They pinch my fingers and scratch furniture. And, like LowePro, big name labels, some removable with mild violence, some not. Why not put on a label that says "I'm a camera bag, steal me!" It's possible that I've purchased more camera bags than anyone on earth, and honestly, Think Tank does the best camera bags, and has shoulder bags in several different shapes and sizes that work really well for a small kit...if you want to carry a camera bag. I have had versions of all of your "sensible, mainstream well-engineered" bags, and basically, I now avoid them; I find them sort of okay, but not to be trusted. I was once working in fairly rough conditions on an archaeological dig, and because I was the dig photographer, had a large kit and a rolling bag from one of your mainstream makers. I had to roll it a short distance up a gravel track (25 yards?) and one of the wheels broke in the first week, and I had to start carrying it. That was not good, in temps of 104F. I still have a big LowePro bag, but it's strictly confined to the back of my ridiculous, gas-guzzling SUV as an equipment cache and as storage. Kata (are they still around?) is an Israeli brand best known for its extreme level of padding -- they are much bigger on the outside than on the inside. I thought of them as like a combat bag. You could drop them off a roof, and the contents would be protected. The problem was, they wouldn't carry much for the size of the bag. And the bag itself was heavy. Very well-made, though. Domke bags and others like them are okay if you're willing to let your cameras and lenses take a few dings. Newspaper shooters uses them, because they carry all kinds of crap and they want a light bag with fast access, but I don't think they provide enough protection (from impact, dirt and thieves) for most users. Billinghams, which are sorta richie-rich versions of Domkes, are like carrying a sign that says "steal me." A Crumpler has been sitting on a shelf in a storage room for several years. If you want it, you can have it. I may have ripped some of the guts out of it to use in other bags. I now find that I mostly use non-photographic bags. 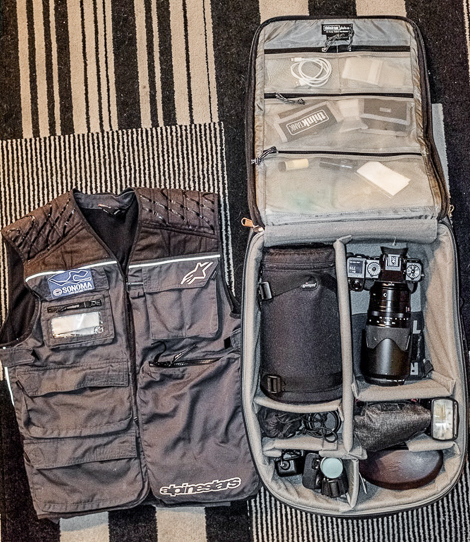 When I travel by air (New York, LA) I usually carry a two-body, two-lens m4/3 kit, with charger and two extra batteries, in an Eagle Creek packing cube which then goes inside a beat-up looking Arcteryx (non-camera) pack, an unlikely target for a thief. The cameras are GX8s, the lenses are the two Panny f2.8 zooms, and both cameras have UP straps. color-over the logo with a black marker. I've done that several times with different brands of photo gear. If anyone notices the logo they realize that you are conservative; don't penalize yourself. Think Tank really should be in consideration as your third "T" brand. I'm in the exact same position as you; my current shoulder bag for the G9 (with grip even) and 2-4 lenses is the older Retrospective 7. If you can still find it, it's going cheap. The included strap hasn't slipped off my shoulder yet, so it's a good sign. The only part that doesn't meet your criteria is the strap, which is not detachable. It is light (12.8 ounces) and sufficiently capacious at 13 x 5.7 x 9.4 inches to take my Rollei 3.5F, Fuji X100T, film and light meter, Fuji batteries etc. Shortcomings - a bit light on protection, maybe, but I'm OK with that. And the Lowepro badge is small - it looks as if it is sewn on, if so it could removed fairly easily. You are looking for a ThinkTank Retrospective 5 bag! It comes in various hipster and non-hipster colours. I have "Pinestone" (kind of greenish). You can cram all kinds of stuff into one of these. If you need a bit more room the Retrospective 7 is bigger and taller. The Retrospective 6 has the same footprint as the 7, but less height. You want a 5 though for the gear on your list. I suppose you are planning to order something online...without actually seeing how well it is made ? I would suggest a day trip down to B&H Photo. 1. If it is stitched on, take a sharp knife and carefully cut it, take out the remaining threads with tweezers. 2. Alternatively, take a (black? depending on the color of the bag) waterproof fabric marker and 'adapt' the stitching to the background. At least for me, the fabric marker does the trick on the Lowepro to a sufficient extent. Of course, it is not going to be easy to resell the bag:-)). For cameras, I tape over the front markings (brand at the top, the product name/number at the side) with matte black electrical tape - works nicely and can be taken off with no trace. My favorite brand was Kata, from Israel. Some seriously talented designerds therein, who astutely jumped ship and formed Miggo, shortly after Vitec/Manfrotto bought them and watered it all down to make more bucks. I have 6 of their bags for various uses, and their utility and toughness makes me smile. Corinthian leather of camera bags. If the logo on the bag is embroidered, it should be a simple matter to remove the LowePro logo from the bag. A scalpel(ideal) or fresh X-acto knife blade, plus maybe half an hour of your time is all that is required for your bag beautification-through-delogoing project. As a 54-year-old hipster living in Nebraska, I am shocked, shocked, shocked, that you didn't mention my favorite Veblen line, Artisan & Artist! They're pretty great bags and low profile at that. I've got an ACAM 7100, and it's pretty fantastic for my needs. I'm either shooting a Leica or a Pen-F (told you I was a hipster) with prime lenses and it's got plenty of room and looks like a purse on me. Oh, and their silk straps are amazing. Best straps I've ever used in my 40-some years of being a photographer. Back in the '60's my wife bought me a shoulder bag from a high end NYC store called Hunting World, to use as a camera bag. That bag was pretty pricey at the time (for me, but not for my wife who is an expert purchaser of handbags)but lasted into the late '80's. It also made me a confirmed shoulder bag user. These days my walk around camera of choice is a Fuji X100T that I stick in a little Tenba insert that fits into anything that I want. I find it amusing that people fuss about the incremental cost of a bag that will be entrusted with $20,000 worth of gear. If you like the style and it works for you, the extra few bucks to get something well designed, well made and that will last, seems hardly worth the thought. Based on my very biased likes and dislikes I say get a Domke bag of the appropriate size and shape, remove the ridiculous logo (takes 2 minutes), fill it up and go out photographing. Domkes are sturdy, light-weight, and relatively inconspicuous. I've used them for years and much prefer them to other brands. Mike, here's a simple solution to the screaming "Lowepro" logo problem: purchase a $1.49 black permanent marker at your hardware or office supply store and just color the whole logo black -- disappears into the bag color and no-one will notice. It also works great on the "North Face" logos written on the front and back side of their jackets. I'm thinking of monetizing this fix with a YouTube video. I use a LowePro bag to carry my Lumix, er, Panasonic camera. By the way, the LowePro company was started by the same guys who started Lowe Alpine Equipment company. I have Lowe Alpine equipment that has lasted decades. Good stuff. Okay, I gotta weigh in on this one. Kirk Tuck's absolutely correct. 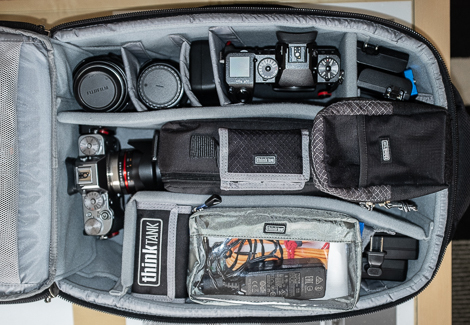 Think Tank has become THE professional's choice of bags, rollers, backbacks, lighting cases, belts, and accessories. Lemme tell ya a little story: Back in 2003, when I first started shooting accredited professional motorsports, most all of the professional PJ's were shooting with LowePro bags and rollers. Literally within in one year, virtually ALL the working pros I was working with (including the international guys who "followed the series" all year long) had switched to Think Tank rollers, bags and belts. Think Tank literally took over the entirety of the working pro PJ market within one year. They also have a consortium of working pros, including Pulitzer Prize winning photographer Deanne Fitzmaurice, that provide constant input for making their bags better and better. I've been using their gear since 2004 and Kirk's comments are spot-on. Here's my Airport Advantage roller, configured for the big real estate shoot I had all day yesterday. It has my X-H1, X-T2, X100F, four lenses, including my 50-140 f/2.8, two flashes, batteries, cables, cards, chargers, and bunch of other stuff, including my iPad. The outside sleeve can carry my 15" MacBook Pro. The small bag at right is for the X100F. Look at all those Think Tank logos...why is that? 'Cause the stuff just flat works and is built-to-last. When I'm not out on a professional shoot, my "Go Bag" is a much-loved Think Tank Retrospective 5, the best, more versatile, most durable and most comfortable shoulder bag I've ever used, hands-down (and yes, I've owned and used Tenba, Domke, and LowePro; none of 'em can hold a candle to the Think Tank Retro series, IMHO). 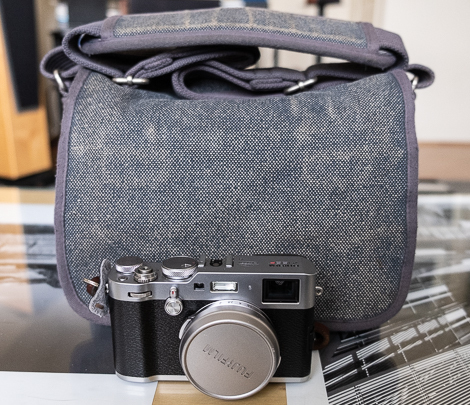 Here's my Retro 5 with my X-H1 with lens attached, plus two lenses in the side pockets, and my X100F in the front pocket. Or, need to bring a speedlite? No prob; the Retro 5 configured with the same basic kit with a flash. You could even put the X100F on top of the flash if you wanted to. All this in a compact and very comfortable bag; once it wears in, its literally like a comfy pair of jeans. Here it is closed up with my X100F for scale. Yes, you're wrong. Pros don't give a sh*t about the latest styles and fashions. What they care about is configurability, durability and ruggedness. "Although that's probably partly because there are no Ronnie O'Sullivan caps or Ronnie O'Sullivan T-shirts or jerseys. At least I don't think there are." I think "Lumix" is a perfectly good brand name for the cameras. "Panasonic" (formerly Matsushita) could be a 101 different things, in dozens of different markets. I bought a LowePro Slingshot bag some years ago, for a small DSLR camera I no longer own. I've repurposed it for my LUMIX GX7. 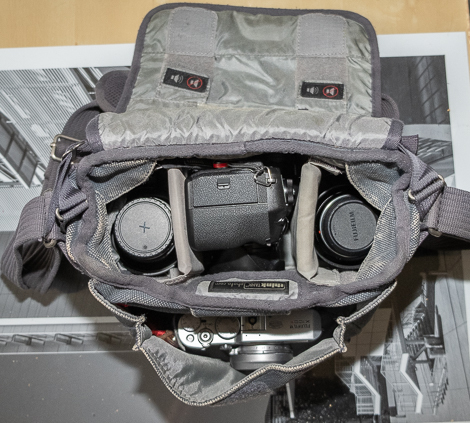 I can slide the backpack over to my belly, zip open the top, and grab the camera that is positioned for ready use. Space for two extra lenses on both sides of the attached lens. A big-enough pocket to hold miscellaneous useful crap. And, yes, it has a "rain cover" built into a pocket on the under side ... which I've never used. Not everything needs to proclaim, "affluent and savvy." Sometimes good enough is, really, good enough. You can also look at Manfrotto bags. I own a smallish Kata bag - they've supposedly been merged into Manfrotto. Never bought a Manfrotto-branded bag, but it's another option. Suggest you look at Peak Design’s everyday sling 5L bag. I hope to never have to shop for another camera bag. Here is what I am using now, hope it helps. Think Tank Retrospective 7 for Fuji X-H1 and a lens or two: I have had it for about four years and while tough, you cannot detach the strap to hook it to a chair leg at a restaurant. It didn't take long for the material to soften so I always have to be careful because it will happily roll down hill. The Retrospective 5 might be a better size for m4/3. Tenba DNA Messenger 15 slim: Love it. I can take it to clients as my laptop bag or use it for my Fuji gear or carry both. A bit large so smaller size could be nice. Has a secondary strap so when you bend over the bag won't come swinging around to plow into your leg whilst tying your shoe. Great looking as well and does not scream "dope with camera gear". I never use the rain covers. If I ever think I might get caught in a major downpour, I just keep a plastic garbage bag within reach. I still have a Think Tank Airport Anti-dote that gathers dust. It has a tendency for the top strap to gradually creep up into choking territory while walking any significant distance. I have since switched to a Tenba insert bag and use a good hiking backpack on the rare occasion I need one. This is funny Mike, one of my longest ongoing series is of manufacturers names and logos from when they were proud to put their name on their product. It was kicked off by the infamous GM Mark of Excellence, a paper sticker they felt obliged to stick on the door sills of their cars when they were being castigated for their lack compared to the then contemporary imports. That series is pretty large and still being added to. Can you sew a patch of fabric over the Lowepro label like putting tape over Lumix? Maybe you can find something embroided that you like? In sharp contrast, I leave the Lumix moniker alone on my GX1 because Lumix is a well known brand of juicer-mixer-grinders and sandwich toasters here in India--and who would want to have anything to do with a camera made by a kitchen appliance manufacturer? So I can leave it on a park bench while I go look for a public utility, and lo and behold!It's still there when I return. No living creature within a hundred yards of it except maybe a stray canine eyeing it speculatively, probably with a view to cocking a leg at it. Didn't know you were a humorist, Mike. Laughed my guts out. Thanks a ton for this. Just take a waterproof black marker and turn the Lowepro logo black-on-black. Problem solved. From the owner of a Lowepro photo rucksack that was bought when the Kodak 14n came out. About 16 years ago? The camera is long gone. The rucksack is still in use - and it still looks like new.